AUCKLAND, New Zealand (AP) — Rain, wind and a distant earthquake didn't seem to dampen the enthusiasm of New Zealanders who turned out to see Prince Harry and wife Meghan on Tuesday. 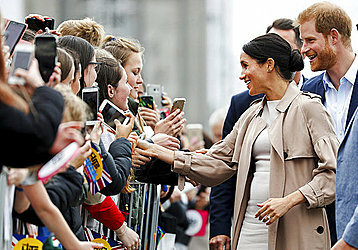 The Duke and Duchess of Sussex met with people in Auckland during a walkabout on the penultimate day of the couple's South Pacific tour. "It means the world to me," Sergel said. "I am so shaky and flustered. When I first saw her I cried." Many thousands of people across the country felt the quake, although those attending the event with the royals said they didn't feel it there. When Prince Harry and Meghan got married, they asked that people donate to a charity instead of giving them wedding gifts, and so New Zealand's government donated money to Pillars.